Low emissivity (Low-E) actually low thermal emissivity is a quality of a surface that radiates, or emits, low levels of radiant thermal (heat) energy. All materials absorb, reflect and emit radiant energy. The benefit of Low- E glass – actually low thermal emissivity – is a quality of a surface that radiates, or emits, low levels of radiant thermal (heat) energy. What does that mean for the consumer? Or better yet, how does that benefit a homeowner and what can a person expect when putting in replacement windows with low-e glass? 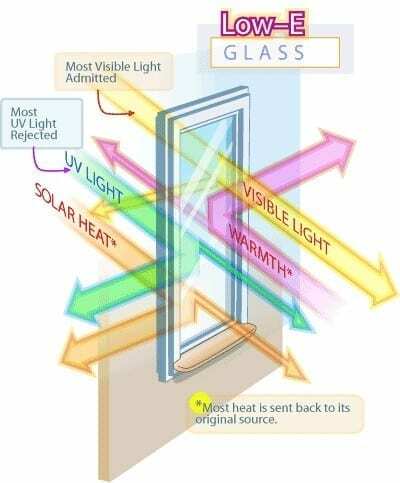 For one, if your home (front or back) faces a southern exposure chances are that during the summer months your home will heats up due to the sun’s rays directly penetrating through your existing clear glass windows. The benefit of replacing your clear glass windows with energy-star rated low-e glass windows is that they will reduce the need for a home owner to constantly run their A/C on hot sunny days. This happens due to the coating of Low-E on the glass. These coatings reflect radiant infrared energy, thus tending to keep radiant heat on the same side of the glass from which it originated, while letting visible light pass. Another additional benefit is that low-e glass protects you furniture, hard-wood floors, carpet and curtains from fading due to the sun.